Our children’s salt therapy room offers children a colorful, fun, entertaining environment where your children can play until their heart is content during each 45 minute session. Our goal is for your children to look forward to coming to The Salt Box with the focus on having fun rather than on receiving salt therapy. Therefore, we offer books, toys, Legos, building blocks and more keep them happily entertained during the salt therapy session. In addition to the playful environment, the floor of the children’s salt therapy room is covered in the finest pink Himalayan salt providing an additional source of entertainment, as many children will feel like they’re playing in the sand at the beach. Whether your children are coming to The Salt Box because of recurring ear infections, colds, asthma, eczema or a variety of other conditions that salt therapy can relieve, we hope they will always be excited when coming to The Salt Box. Our S.A.L.T. Bed™ is an enclosed, dry salt therapy unit which provides individual and personalized skin and respiratory therapy. Our S.A.L.T. Bed™ can be adjusted to various levels and concentration of salt particles to offer a more individualized and specific salt therapy session. For clients who prefer to receive salt therapy privately or for those who are on a tight schedule, our S.A.L.T. Bed™ is the perfect option; You can receive the same treatment as those in our adult/children’s salt therapy rooms in much less time (10-30 mins). In order for salt therapy to effectively relieve skin conditions such as dermatitis, eczema, and psoriasis, the salt must come directly in contact with the affected areas. Our S.A.L.T. Bed™ can be especially beneficial for those people suffering from skin conditions, as the affected area can be uncovered for direct contact with the salt. Whether you are short on time, suffer from persistent skin conditions, or just prefer a private atmosphere, our S.A.L.T. Bed™ is the answer you’ve been looking for. Our adult salt therapy room offers adults a quiet, dimly lit, relaxing environment where you can escape from reality for a 45 minute session. We offer luxurious recliners so you can sit back and relax while receiving the many benefits our salt therapy room provides. 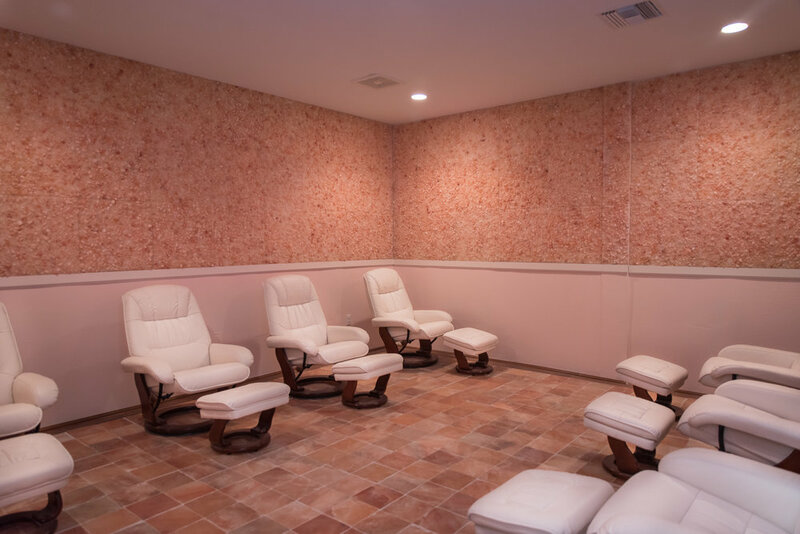 In addition to inhaling the 100% pure salt provided via a Halogenerator throughout the session, our adult salt therapy room also includes the finest pink Himalayan salt on the walls and floor. Whether you’re seeking salt therapy because of a respiratory/skin condition or you are just looking for a place to catch your breath, relax, meditate, or even sleep, The Salt Box is where you want to be. We want everyone to experience the benefits of Salt Therapy. Come in for your first session today!